The color white works well with most other colors in web design and is definitely one of my absolute favorite colors. When you use a lot of white the designs gets a clean and beautiful look. So now you know I like the color white, and thats why I have compiled a collection of 24 beautiful White Free and Premium WordPress Themes. I hope you enjoy the themes. 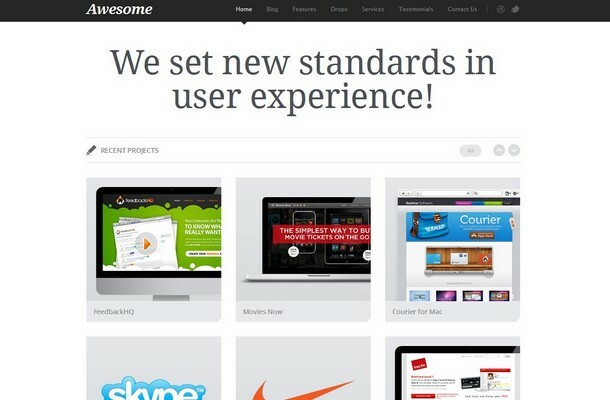 Awesome is a clean and beautiful WordPress Theme in portfolio style. It uses latest HTML5 and CSS3 techniques and suits perfectly for all kinds of creative sites and especially for portfolios! 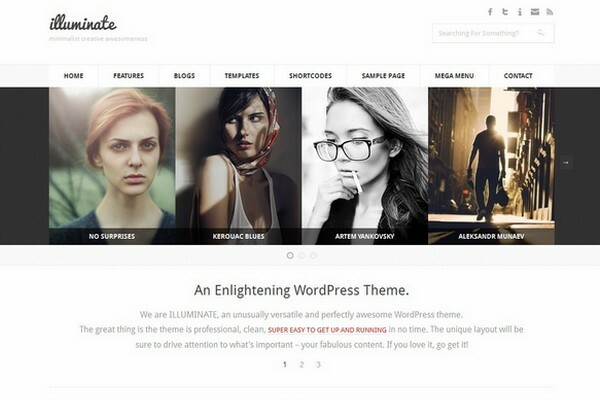 Force is great looking multifunctional and rich featured WordPress Theme. The widgetized mainpage let’s you populate the frontpage however you like. 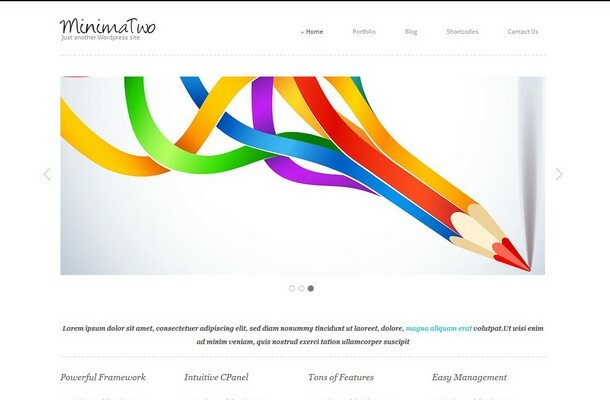 Minima Two is a clean, beautiful premium WordPress Theme aimed at both at web developers and users with minimal knowledge about WordPress. 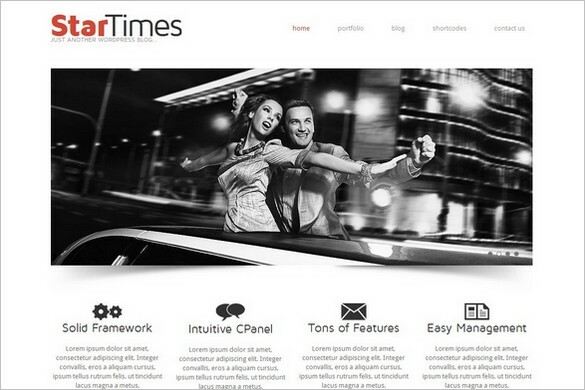 It comes with powerful features and the drag and drop admin panel allow you to create versatile web pages in minimal terms. Phomedia is a premium WordPress Theme in clean style that comes with wp-e-commerce plugin, Ajax contact form, animated sortable gallery and much much more. 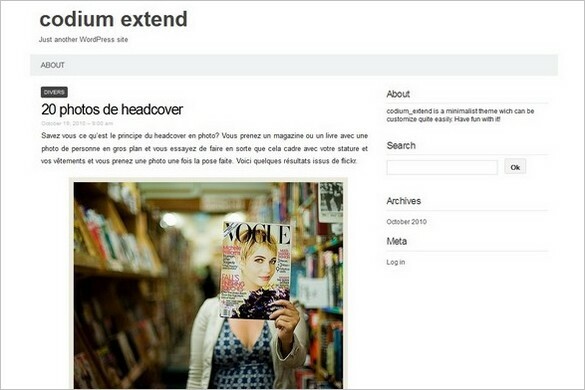 Phomedia will suit photographers who want to sell their images. 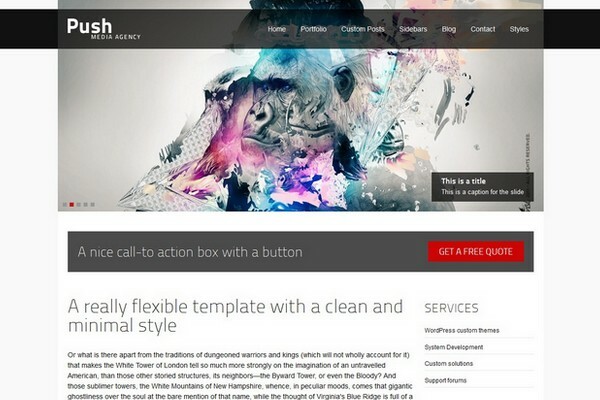 Push is a great looking and professional corporate WordPress Theme suitable for both blogging and showcase purposes. With Push you can really rock up your theme, by using custom pictures and videos all in an integrated fashion. 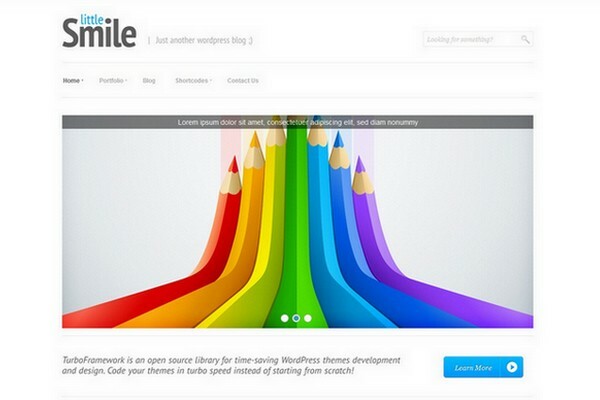 Little Smile is a Multipurpose Premium WordPress Theme and it is extremely flexible and user friendly. It comes with an advanced tool such as TurboEditor that allowing unexperienced user create rich content pages in WordPress engine without a line of coding. 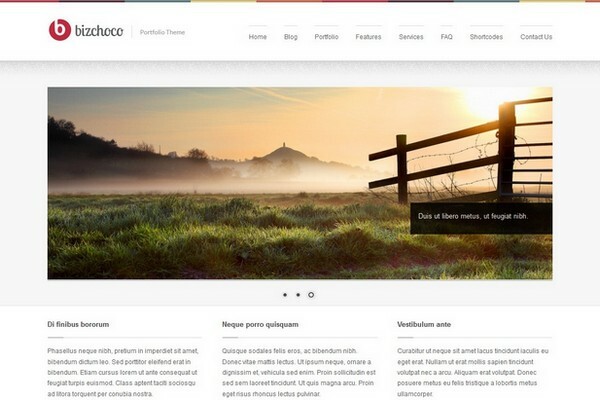 Simfo is a new great responsive WordPress Theme with a subtle touch of grungy texture by Themify.me. The theme works on all screen resolution and most browsers including the mobile devices such as iPad, iPhone, Android, and Blackberry. 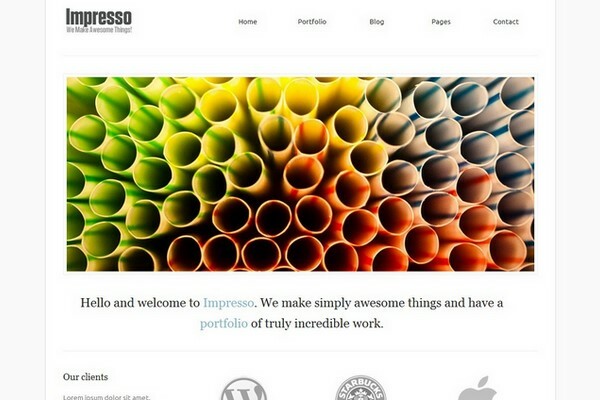 Impresso is a beautiful Premium WordPress Theme for small and large businesses that need a clean, professional, minimalist portfolio site with an amazing nivo slider. 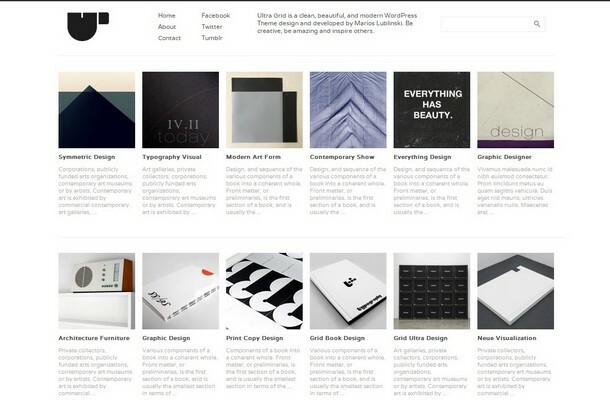 The portfolio section is simply beautiful, easy to use and each portfolio item can have 2 different styles of layout. 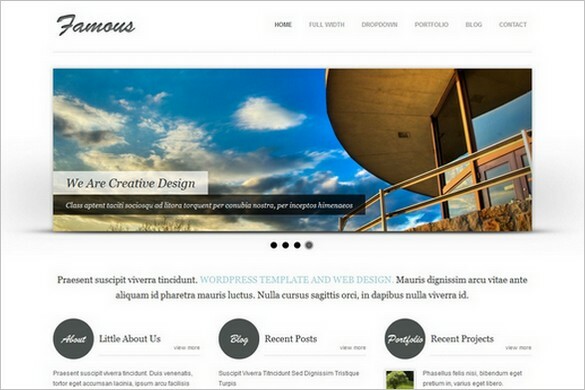 Famous is a beautiful, clean and minimalistic WordPress Theme suitable for portfolio, photography, business and blog sites. 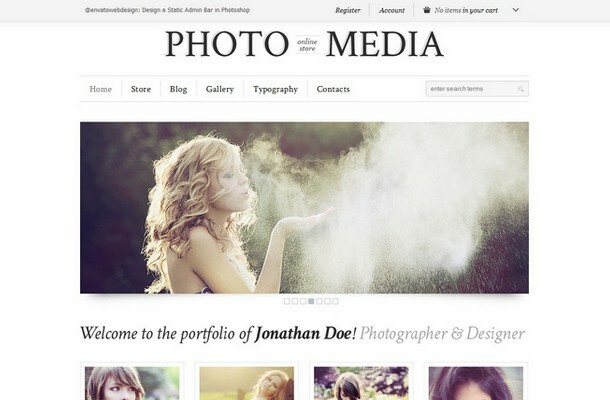 This theme is great to showcase your images, portfolio or work in a professional manner. 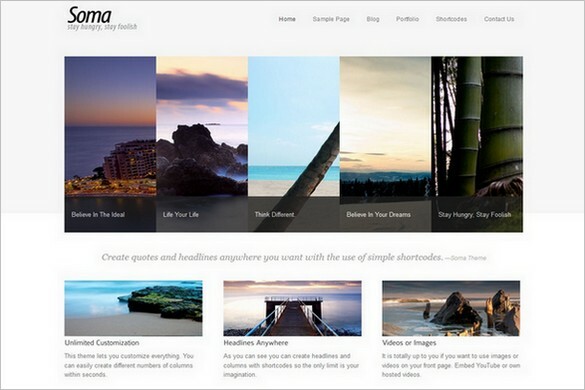 Soma is a beuatiful and awesome modern WordPress Theme that comes with a wide range of customization and backend features. Every single page and tiny section in this Theme is customizable. 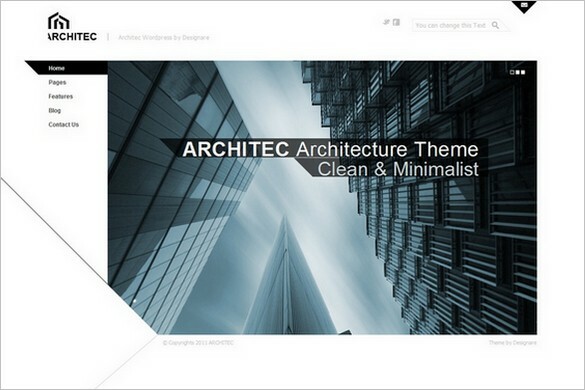 Architec is a premium WordPress Theme with a clean and minimalist design and with very powerful effects. This theme is meant to be used for any architectural firm or freelance architects, but also can be used by creatives to showcase your portfolio or even as a business template. 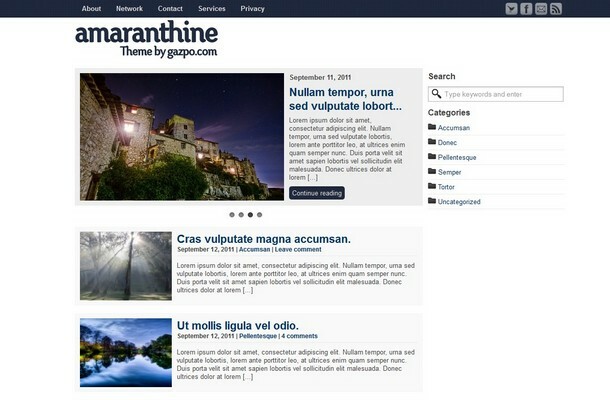 Amaranthine is a clean, professional, 2-column free WordPress Theme by gazpo.com. This theme is easy customizable with theme options and comes with great features such as; WordPress custom menu, custom header, custom background, Facebook, Twitter, Favicon and much more. 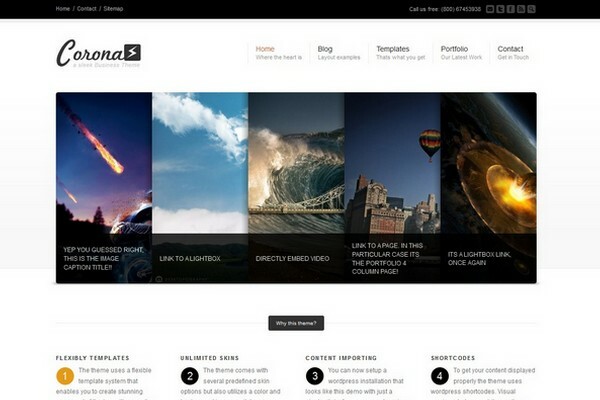 Ultra Grid is a free, beautiful and modern WordPress Theme that comes with a grid like design. 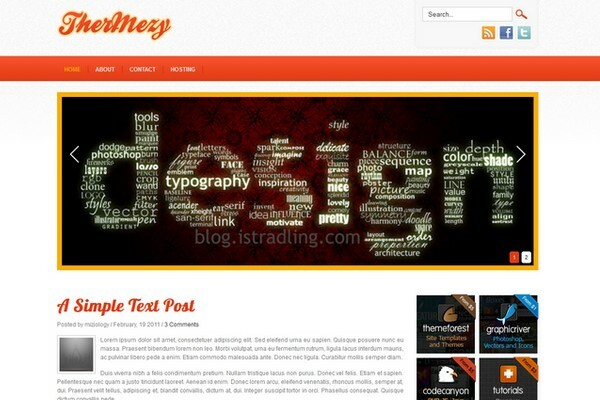 This is a perfect theme for any artist who want to showcase their portfolio in a great looking grid layout style. 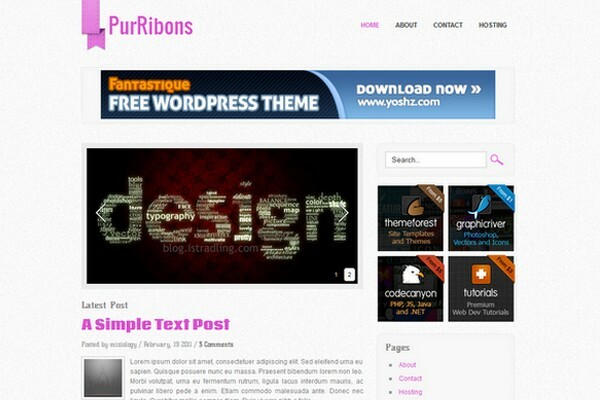 PurRibons is a clean Free Magazine theme that comes with a fantastic design. There are not much to setting up using this theme, just a few simple settings in the admin panel and you are done. 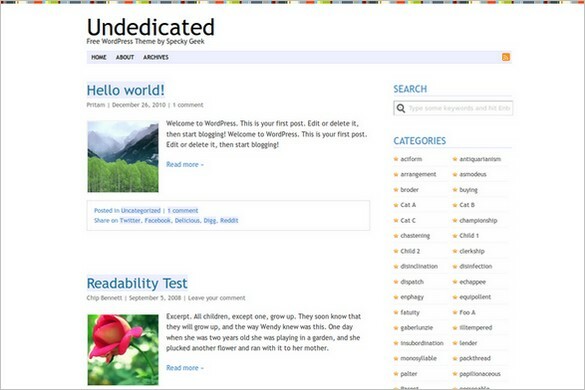 Undedicated is a simple and minimal free WordPress Theme with lots of white space. 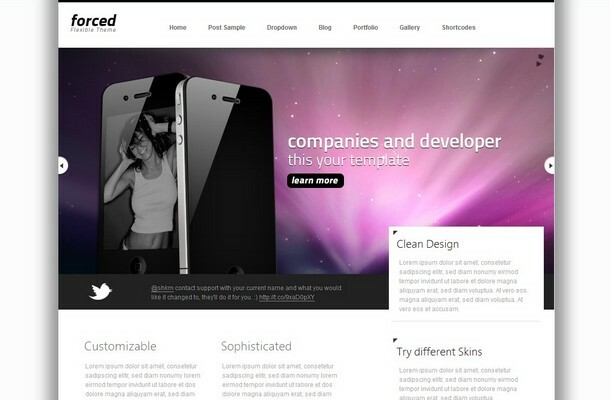 It supports custom header and background is Adsense-ready and are tested with IE6 and above, Firefox, Safari and Opera. 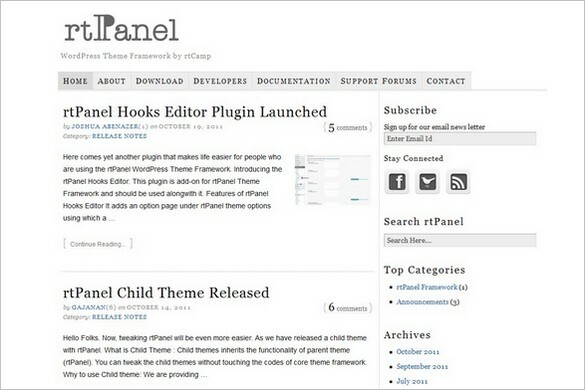 rtPanel is a free WordPress theme framework with support for custom Menu, header and background along with Logo, favicon, featured image, Feedburner, Facebook Open Graph, Google custom search Integration and many more options. 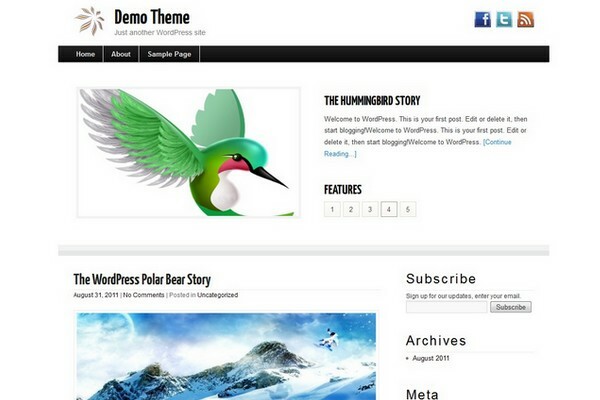 PressWork is a free WordPress Theme framework using HTML5 and CSS3 and built for WordPress 3.2. 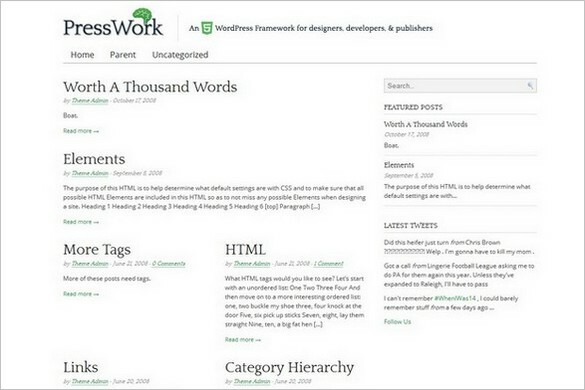 PressWork comes with the PressWork front-end toolbox, which gives users the ability to change their site’s layout and design in a live preview environment.